One time, Srila Prabhupada was considering Yamuna for a position as Governing Body Commissioner, and some devotees complained, "A woman is not cabable of being a GBC." Prabhupada replied: "Men and women are the same on the spirtual platform." Although Prabhupada suggested this job to Yamuna, she was more inclined to Deity worship and singing bhajanas, so she declined. Prabhupada treated his female disciples like daughters. They could approach him for advice and stand wherever they wanted in the temple during worship. "The dogs will bark as the elephant caravan passes." Everyone was excited. Prabhupada was about to arrive in Delhi. Many devotees awaited his arrival, including many ISKCON leaders, so rather than bicker over what aspect of the arrival I would perform, I let the others bargain. "I want to give a garland," said one person. "You get his luggage," said another. "I want to wash his feet," someone else informed us. All the devotional duties were assigned, and I was left. No one had volunteered to lead kirtan, I thought to myself. Prabhupada's arrival was very formal on this occasion, and he hardly looked at anyone as he walked into the airport waiting lounge. He offered pranams, but kept a stern look. While he passed through the devotees, I began to bellow out the Hare Krishna mantra to the old, traditional tune we used to sing in New York and San Francisco. Prabhupada, still aloof, heard the chanting and saw me with the karatals, then his reticence became a bright, wide-open smile. He gave me a big wave. As he got into the car, he invited me in. "I like that tune very much," he said, smiling contentedly. I answered, "Like we sang in San Francisco." We rode together for awhile and were quiet. 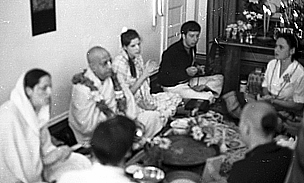 I asked Prabhupada, "Do you think those first days together in San Franscisco were special?" "Oh yes," Prabhupada answered emphatically.